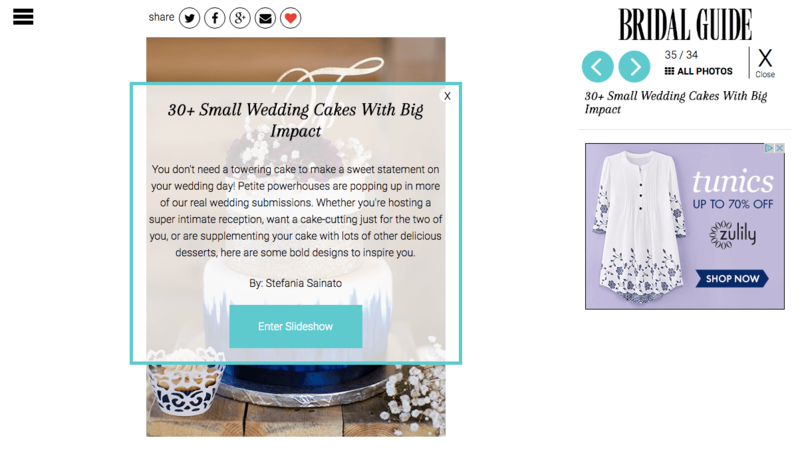 Wedding PR: Bridal Guide, Catersource, SheFinds and more! Another week, another fantastic client feature roundup! This time including Bridal Guide, Catersource, SheFinds and so much more! Check it all out below. Kaysha Weiner Photographer, Don Mears Photography, and Stephanie Yonce Photography were all featured on Bridal Guide in the roundup 30+ Small Wedding Cakes with Big Impact. See the full feature here. Fantasy Sound Event Services was featured on Catersource with the guest article Bridging the Gap Between Vendors and Venues. See the full feature here. Taylor’d Events was featured on Wedding IQ with the guest blog Four Questions to Ask Yourself Before Investing in a Conference or Workshop. See the full article here. Destination Weddings was the cover feature in Travel Week Magazine. See the cover here. Cocoon Events Group was featured on Wedding IQ with the guest article Stuck in a Rut? Try These Wedding Industry Best Practices for Finding Inspiration. See the full feature here. Belladeux Event Design, Destination Weddings, Historic Mankin Mansion, and Cocoon Events were featured on SheFinds in the article 14 Wedding Trends That Will Be Huge in 2017. See the full feature here. Fantasy Sound was featured on Wedding IQ with the guest article The Art of Finding a Mentor. See the full article here. OFD Consulting was featured on WeddingWire with the guest blog The Modern Media Pitch. See the full feature here. Cocoon Events Group was featured on Special Events in the guest article Go Big or Go Home: Luxury Touches for Your Next Event. See the full feature here. Where Will They Stay? was featured on Honeybook with their guest blog Productivity Tips for the Too Busy Professionals. See the full articles here.